notredame-cross-candles, originally uploaded by Ted Drake. This image was created in the darkroom. I projected a slide from inside Notre Dame onto a Polaroid type 55 negative. 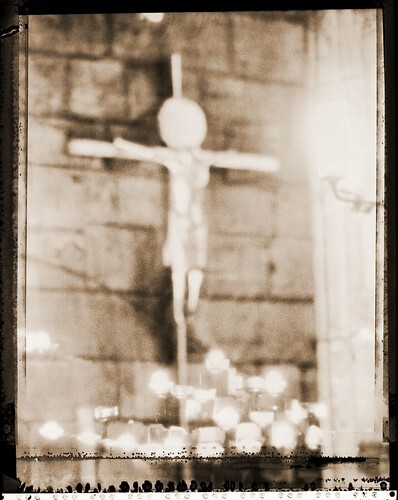 This is actually a double exposure as the crucifix and candles were in two separate areas of the original slide. I then processed the negative as usual. I originally shot this image on slide film. It had candles in the foreground and the crucifix in the background. 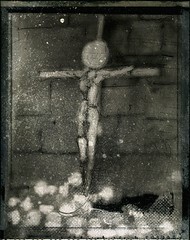 I created this image while playing with the idea of Polaroid type 55 being a canvas instead of just a negative. I love the native framing element of Polaroid film. Combine that with the unique surface textures, range of values, and the ability to manipulate and I’m a happy camper. I’ve since used this technique of projecting slides onto Polaroid film to create other images. I created a second negative to modify by hand. I’m not one for Photoshop tricks as I need to get my hands dirty. I attacked this second negative with paint, sharp objects, xerox transfers and more. The globe-like head on Christ has always intrigued me. In the original image, you can see that it is a plaque behind his head. However, this is obscured in the Polaroid version.